One avocado deer saunters across the spread, two radish mice scurry by, until finally ten watercress seahorses swim onto the scene--all of the ingredients in one big salad! 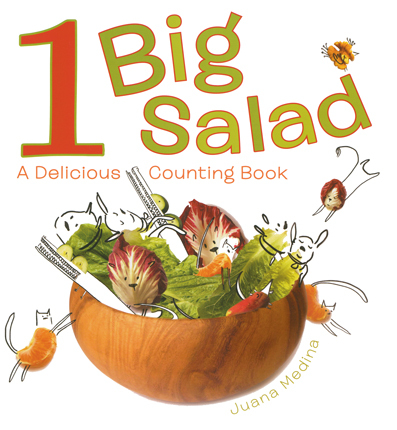 School Library Journal - 05/01/2016 PreS-Gr 1—Starting with one avocado deer and working up to 10 clementine kittens, the anthropomorphic fruits and veggies in this counting concept book come together to create one big and appealing salad. A recipe for a healthy and simple dressing is included on the last page, along with some playful lemon pigs, a porcupine-ish dish of olive oil, and a flying saltshaker bird. This whimsical book features a salad that takes kids beyond mere lettuce to encounter more sophisticated garden delicacies, like maroon radicchio lions, vibrantly green romaine dogs, and juicy orange clementine kittens. The illustrations contain a great variety of fruit and veggie shapes and colors. For instance, there are purple carrots, oblong radishes, and tomatoes in shades of yellow and green as well as red. Created digitally, in combination with fresh fruits and veggies from the University of the District of Columbia's Farmers Market, the images use white space and color to great effect. The veggies and fruits, augmented with arms, legs, ears, antlers, and wings created with confident and bold, swooping black lines, stand out against the crisp white background. Minimal text is printed in a large font that pops off the page. Numbers are printed as numerals and written out (1 and one). - Copyright 2016 Publishers Weekly, Library Journal and/or School Library Journal used with permission. School Library Journal - 12/01/2016 PreS-Gr 1—With simple doodles, Medina adeptly transforms photographs of sumptuous fruits and vegetables into an array of cheery animals. The author counts her enchantingly quirky creations ("one avocado deer," "two radish mice"), resulting in an exuberant, mouth-watering medley that's sure to have children eager to master their arithmetic skills—and bound to inspire budding gourmands. The concept book has never been so fun. - Copyright 2016 Publishers Weekly, Library Journal and/or School Library Journal used with permission. Booklist - 01/01/2017 Eating your vegetables is a lot more fun if you're counting while doing it. Medina combines math and art by turning photographs of salad veggies into animals by adding creative black-line drawings, with the sum being an exuberant concept book for young foodies. Ample white space and a clean design leave room on each spread for a large numeral, the number word, and the corresponding amount of brightly colored veggie animals to be counted. One Avocado Deer uses half an avocado with the pit positioned as the nose. Two Radish Mice features the radish roots as their long tails. 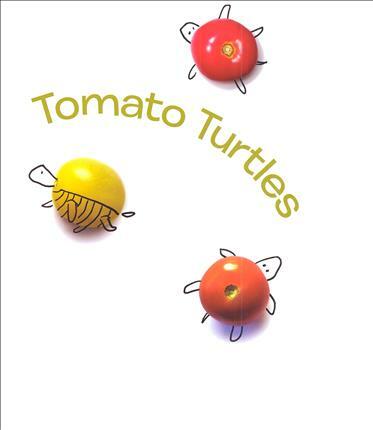 Five Tomato Turtles employs heirloom tomatoes for the turtle shells in the colorful mix. And who’d have thought that radicchio leaves would make such great lion manes? By the time the hungry reader gets to Ten Clementine Kitties they will be ready for the final spread—One Big Delicious Salad! One final dash of fun is an appended salad dressing that young chefs can make to practice measuring and using simple fractions. - Copyright 2017 Booklist.